The pin(s) are awarded each year in a different color. 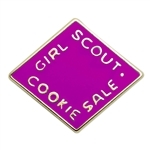 The 2019 pin color is Fuchsia. 3/4" diameter. Clutchback. Imported. The Journey Summit Award Pin is earned by girls who have completed all three National Leadership Journeys at their grade level. The colored border around each pin corresponds to their grade level. Imported. Girl Scout Cadette Journey Award Patch Set. Iron-on set of three patches, Interact, Diplomat and Peacemaker fit together to form cube shape design. Earned Award. Girl Scout Cadette LIA (Leadership in Action) Award Patch. This award is for mentoring Girl Scout Brownies through the Quest. Iron-on Patch. diamond shaped patch with elf design. Earned Award. Girl Scout Cadette Journey Award Patch Set. Iron-on Patch. diamond shaped patch set with the words: "Aware," "Alert," and "Affirm". Imported. Girl Scout Cadette WOW! Wonders of Water Leadership in Action Award Patch. This award is for mentoring Girl Scout Brownies. Iron-on Patch. diamond shaped patch with water drop design. Imported. Iron-on diamond shaped three patch set with the words "Monitor," "Influence," "Cultivate." Imported. Iron-on Patch. This award is for mentoring Girl Scout Brownies. Iron-on diamond shaped patch with Brownie Elf design. Imported. Iron-on Patch. Iron-On Patch. Imported.